Macedonia is a country in deep trouble. Under a veneer of normality lies a climate of deep mistrust between all the political parties and between the main ethnic communities. Several incidents of inter-ethnic violence took place in the capital city earlier this year and are on the increase. Political dialogue, insofar as it exists between the parties, remains confrontational. In May 2015, there was again violence namely in the north of the country. Not only Macedonians living at the tops of their nerves. The international community looks worried how Russia supports the controversial government while Europe and the United States backs the opposition. 27 May 2018, High Representative/Vice President Federica Mogherini met with Minister of Foreign Affairs of the former Yugoslav Republic of Macedonia Nikola Dimitrov to be briefed about the significant progress made in the ongoing negotiations on the name issue (officially solved 25-01-2019). Federica Mogherini expressed the European Union's support for the ongoing work and the readiness to accompany an eventual positive outcome that would be key not only for the country, but the whole region and the European Union. 17 June 2018, The Foreign Ministers of Greece and Macedonia signed an agreement on a new name for the former Yugoslav Republic on Sunday: the Republic of North Macedonia. The agreement, signed on the Prespa lake in northern Greece, on the border with Macedonia and Albania, must put an end to almost three decades of talks between the two countries on the name of the young Balkan state. After the ratification of Sunday, the parliaments still have to give their approval. Macedonia also wants to hold a plebiscite. The leaders of Greece and Macedonia reached a compromise on the name issue on Tuesday. Both countries have been fighting each other for years about the name Macedonia. The conflict dates back to 1991, when Macedonia peacefully separated from Yugoslavia and continued as the independent Republic of Macedonia. That fell badly in Greece, which itself has a historic region Macedonia. European Policy Institute in Skopje published in January 2016 in the document "Implementation of Urgent Reform Priorities slower then the restoration of anti-reformist practices": By signing the Przhino Agreement in June 2015, the four largest Macedonian political parties agreed "to implement all recommendations to be issued by the European Commission in relation to systemic rule of law issues". In so doing, the political parties agreed to implement the Commission's “Urgent Reform Priorities” (URPs), even before their publication, also in June 2015. Within the framework of its enlargement policy, the European Commission linked extending its recommendation to open accession negotiations with the Republic of Macedonia (RM) with the "continued" implementation of the June/July political agreement and "substantial progress in the implementation of the Urgent Reform Priorities". - Explicit demands for the revision and repeal of lustration. September 2013, the policy brief 'Macedonia - A country in crisis' was released from an associate Senior Research Fellow at CEPS and former European Union Special Representative and Ambassador, Head of Delegation in FYROM. 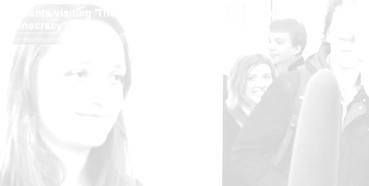 The country submitted its candidature for EU membership in March 2004 and was the first country in the Balkan region to sign, in 2001, the Stabilisation and Association Agreement; the process established by the EU as the first step towards gradual EU integration. This was the year in which the country witnessed an inter-ethnic armed conflict, which was brought to an end by the signing of the Ohrid Framework Agreement in August 2001, an agreement brokered by the EU, the US, NATO and the OSCE. The EU Council granted Macedonia candidate status in December 2005, based on the positive Opinion from the European Commission on the country's application. In October 2009, the EC recommended that a date be set for the opening of negotiations. The EU Council has not yet endorsed this recommendation. Although the (Former Yugoslav) Republic of Macedonia is a fairly small country, with slightly more than 2 million inhabitants and 60% of the land area of the Netherlands, it is simultaneously a tremendous diverse place. Its varied geography, flora and fauna have long attracted many tourists; more interesting perhaps, is that its ethnic majority constitutes less than two-thirds of its population, which clearly makes Macedonia. In 1991, as it seceded from collapsing Yugoslavia, Macedonia adopted a new constitution and became a parliamentary democracy. The challenges of successfully conducting multiethnic democracy have been clear in the Macedonian case, illustrated by power being devolved to the large Albanian minority following civil unrest 2001. Moreover, its accession to several international institutions has been impeded by the Greeks, who take issue with Macedonia's name (Report of the hearing at the ICJ 30 March 2011) considering it a territorial claim on the entire historic Macedonian region which stretches well into Northern Greece. In antiquity, most of the territory that is now the Republic of Macedonia was included in the kingdom with people of Thracian origins but also parts of ancient Illyria and Dardania and other diverse tribes. None of these had fixed boundaries; they were sometimes subject to the Kings of Macedon, and sometimes broke away. After early victories of Philip II of Macedon in 356 BC, he absorbed the regions of Upper Macedonia into the Kingdom of Macedon. Philip did not make the people of Upper Macedonia subject but instead made them equal to the Macedonians of Lower Macedonia. Philip's son Alexander the Great conquered the remainder of the region, reaching as far north as the Danube, and incorporated it in his empire. The Romans established the Province of Macedonia in 146 BC. During the 580s, Byzantine literature attests to the Slavs raiding Byzantine territories in the region of Macedonia, which also created icons of inconceivable beauty. The Slavic peoples that settled in the region of Macedonia accepted Christianity as their own religion around the 9th century, during the reign of the Tsar of Bulgaria. After this period the Byzantines restored control over Macedonia (and all of the Balkans) for the first time since the 7th century. However, by the late 12th century, Byzantine decline saw the region contested by various political entities. In the early 13th century, a revived Bulgarian Empire gained control of the region. Plagued by political difficulties the empire did not last and the region came once again under Byzantine control in early 14th century. In the 14th century, it became part of the Serbian Empire, who saw themselves as liberators of their Slavic kin from Byzantine despotism. Skopje became the capital. With the appearence of a weak successor power struggles between nobles divided the Balkans once again. This coincided with the entry of the Ottoman Turks into Europe. Central Balkans fell to Turkish rule — and remained under it for five centuries. Then, several movements whose goals were the establishment of autonomous Macedonia, encompassing the entire region of Macedonia, began to arise in the late 19th century. The early organization did not proclaim any ethnic identities; it was officially open to "...uniting all the disgruntled elements in Macedonia and the Adrianople region, regardless of their nationality..." The majority of its members however were Macedonian Bulgarians. The uprising and the forming of the Krushevo Republic are considered the cornerstone and precursors to the eventual establishment of the Macedonian state. Following the two Balkan wars of 1912 and 1913 most of its European held territories were divided between Greece, Bulgaria and Serbia. The territory of the modern Macedonian state was then named "Southern Serbia". After the First World War, Serbia became part of the Kingdom of Serbs, Croats and Slovenes. In 1929, the Kingdom was officially renamed the Kingdom of Yugoslavia and divided into provinces. The concept of a United Macedonia promoted the idea to liberate the territories occupied by Serbia and Greece and to create an independent and united Macedonia for all Macedonians, regardless of religion and ethnicity. However, the Great Powers did not adopt this idea, because Serbia and Greece opposed. In this opinion, the Commission recommended that the European Community accept the request of the Republic of Macedonia for recognition, holding that the Republic had given the necessary guarantees to respect human rights and international peace and security. However, the EC was initially reluctant to accept the recommendations in this opinion because of Greek opposition. In 1999 hundreds of thousands Kosovar people fled the country to FYR Macedonia. To guide consequences, the Ohrid Framework Agreement was signed, the peace deal by the government of the Republic of Macedonia and ethnic Albanian representatives on August 13, 2001. The agreement ended the armed conflict between the National Liberation Army and the Macedonian security forces and set the groundwork for improving the rights of ethnic Albanians. The Agreement also included provisions for altering the official languages of the country. Task Force Harvest and Task Force Fox helped further to achieve the aims of the agreement. 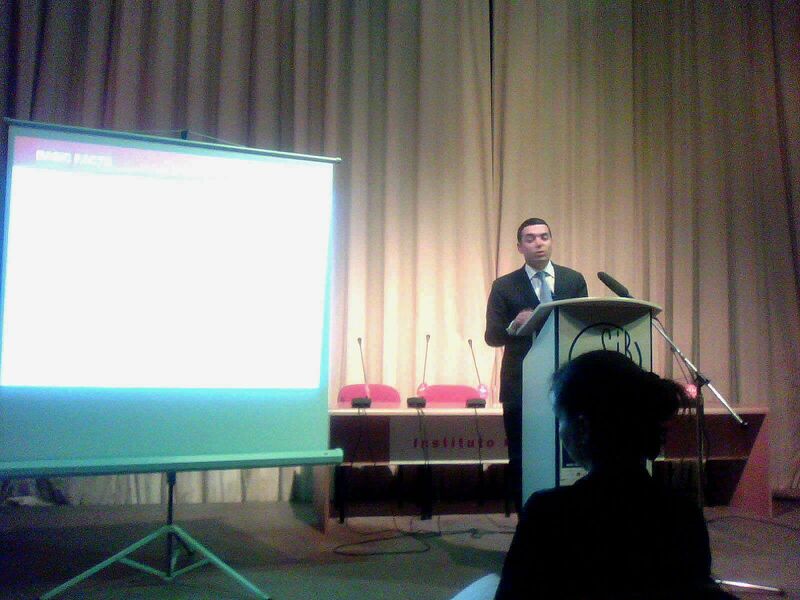 In 2005 FYRM became an EU candidate-member and triggered negotations to realise liberalisation of visa regulation. The MATRA-program form 2007 took care of strengthening stability by building up a societal midfield: transformation and strengthening of institutions, capacity building on the level of central and local government and civil society in order to strengthen democracy and the rule of law. Participation as member of a lead World Bank constituency group is an example for the efforts to strive after stability. Several memberships with supra-national bodies were settled (OSCE, Council of Europe). Concerning a NATO-membership, while criteria were obeyed, there was the veto by Greece. Still left is position of Roma, implementation of energy and milieu legalisation and improvement of labour by stronger external economic ties. Viniculture is one of the export products. International observers have the opinion that progress stopped. In some areas there is even talk of decline. From media it is expected that they are government-minded and the judiciary is not independent. The young held street-protests for more transparacy. Macedonia wants to take one's measure for a national identity, due to accession to the EU. 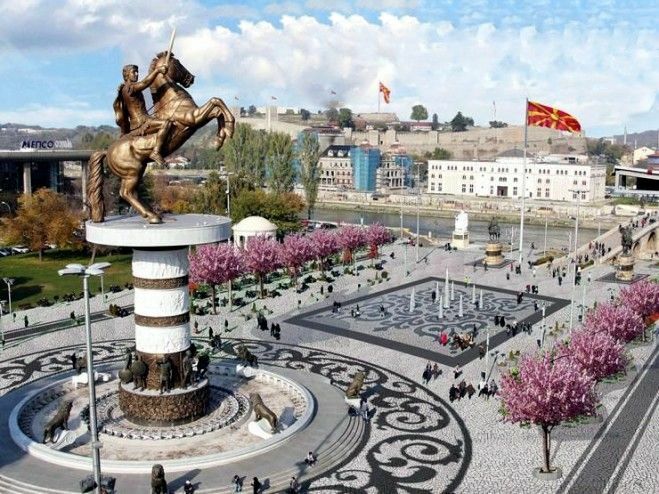 In Skopje, builders are working on bridges, a triumphal arch and high neo-classic facades, and there are a large number of new statues, representing national icons, freedom fighters and Church Fathers. All these initiatives are related to the project 'Skopje 2014' including a fountain from the socle of the 22 meters high statue of Alexander the Great (356-323 BC) on a rearing horse and the new Macedonian-gate. Other attractive places worth to see are the fort and the beautiful stone bridge leading to a piece of ancient Turkish city with small streets, a bathhouse, karavanserai and mosque. The rest was destroyed during an earthquake in 1963. Skopje was rebuild in Yugoslav concrete style. The country had been forgotten a long time, missed and denied by surrounding powers such as Bulgaria, Ottomans, the Greek and former Yugoslavia.